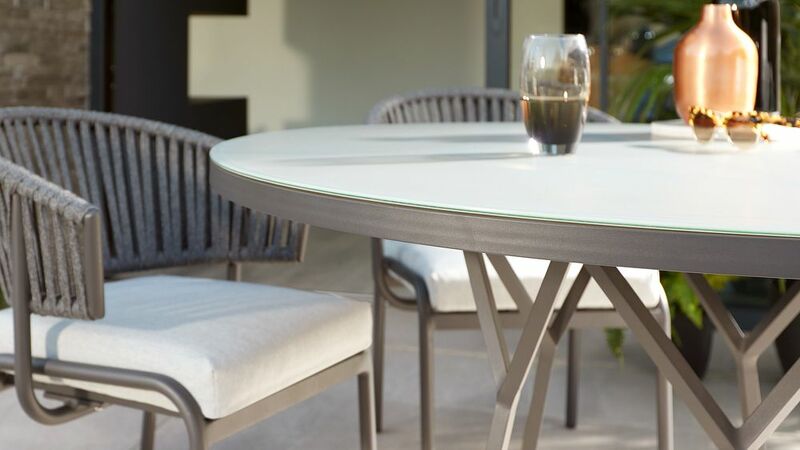 If you’re looking for a sophisticated and stylish garden dining set, the Porto and Ivy is just the thing. 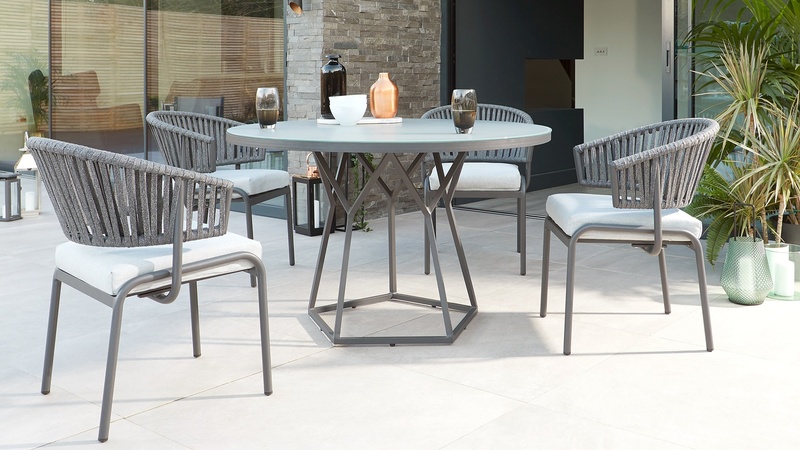 With a beautiful geometric design to the table base and intricate rope back detailing on the chair this dining set will make a modern addition to your garden dining setting. The Porto’s defining feature are the strong, pentagonal lines on the pedestal base. This design is exclusive to Danetti, lovingly created by our in-house designers which means you won’t find this table anywhere else on the market. The Ivy Garden Chair has a complex, woven rope detail which really makes it stand out from the crowd. The woven rope has been designed to a high quality to withstand the outdoor elements, meaning it's low-maintenance and ideal for outdoor use. 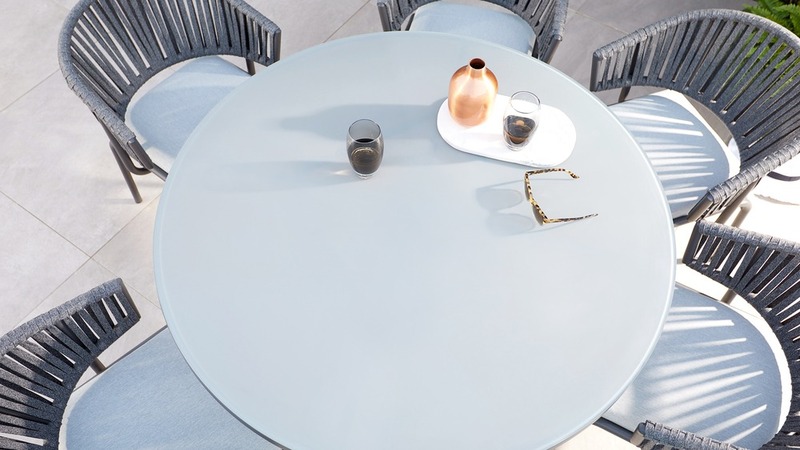 The grey frosted glass top on the Porto round table, has a hazy and soft appearance, which really gives it a premium look. Frosted glass isn't overly reflective which means you won't get a glaring reflection of the sun while enjoying meals. The main frame of the table and chairs are aluminium tube. This makes them lightweight and therefore easy to move, however it remains incredibly sturdy and durable. 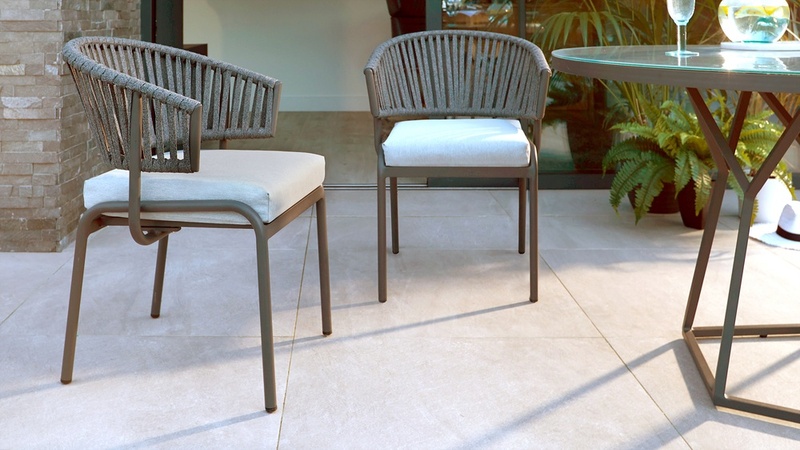 The seat cushions on the Ivy Garden Chair have been treated with a showerproof coating. This means that light rain or moisture won’t be absorbed into the fabric, so you won't have to take the cushions in every time there's a light shower. 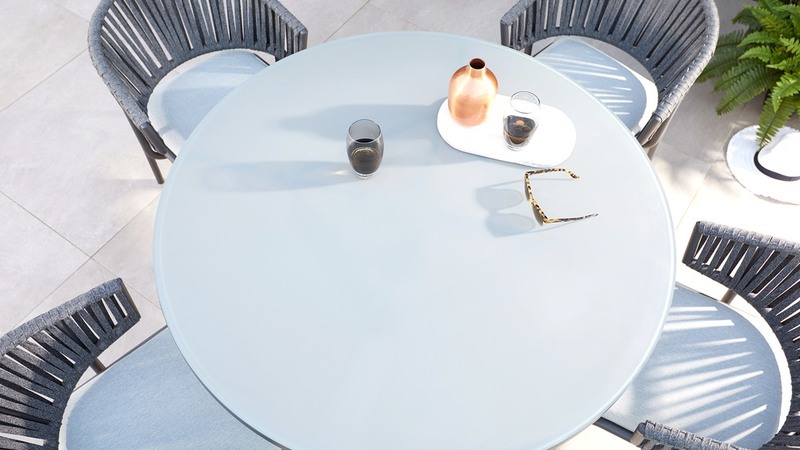 The Porto Table is a generous size, so you’ll have plenty of space to seat 4 people but you can easily add a couple more chairs, as outdoor dining tends to be less formal. Having a pedestal base also means that everyone has legroom and you won’t be restricted by table legs. Take a look at our other dining sets for more inspiration, different size tables and various seat styles.